AE Aerospace was established in 1996 to service the aftermarket needs of the aerospace industry. Over time, the company has moved into New Product Introduction and now increased manufacturing volumes to support their customers’ Original Equipment assembly lines. AE Aerospace is known internationally for producing high precision machine components, as well as its sharp reactions to changes in the market. 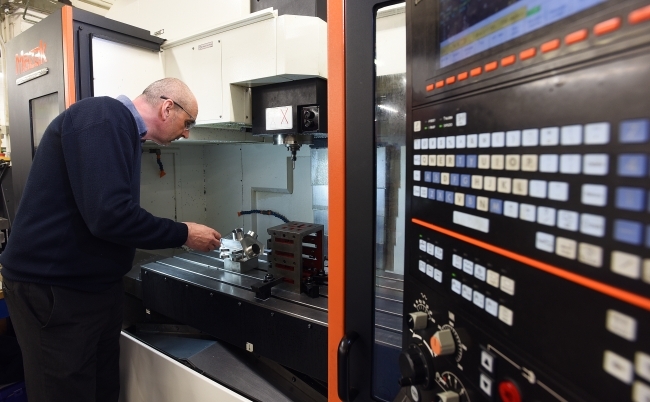 As a significant player in the precision components industry, AE Aerospace is a world-class supplier of high-quality precision machined components to the aerospace, marine and defence industries. Over the last 20 years, the company has delivered a broad range of engineering solutions for prime manufacturers including Bombardier, Airbus, and Boeing, Tier One companies such as Rolls Royce and Siemens and Tier Two companies such as UTC Aerospace Systems, Moog, offering robust and dependable engineering packages, from concept to execution. What sets AE Aerospace apart from competitors is its ability to help customers get their products to market swiftly, without compromising on quality – a skill that’s in high demand as aerospace is a sector which is growing – with 34,000 new planes being built within the next 20 years. This continued demand in the sector means the company needs to be on top of its game when it comes to serving the industry. AE Aerospace Managing Director, Peter Bruch explains plans for future business growth and development. How did you decide the company’s direction of growth? Although AE Aerospace is an SME company, our strategy is like that of a large corporate. I believe that putting the time and effort into training and staffing, as well as investing in new machinery, is crucial to business development and growth. The company’s ethos is to remain competitive by continually investing in people, technology and processes. Several core members of the team and myself, joined Aston University’s Advanced Services Group in late 2015 to internally increase awareness of servitization as a concept, and to learn how to integrate and develop it in order to provide better value for our customers. This helped us transform our thinking to focus more on the provision of services to support our products and our customers’ capability requirements rather than mere products alone. Since then our transformation journey has been well underway – and ‘glass factory’ is a major part of the changes we are making – where our customers will be able to access machining schedules and utilise machining time by the hour. How have you implemented Servitization? In its simplest terms, servitization refers to industries using their products to sell outcome as a service rather than a one-off sale. For example, Netflix and Spotify are probably the most well-known examples of servitization, delivering media as a service, rather than customers buying the CDs, DVDs that then produce those outcomes. A transparent factory operation, known as a ‘glass factory’ came about from our desire to meet demand and continue to exceed customer expectation. A ‘glass factory’ is an open and transparent shop floor that enables production-wide visibility and faster identification of problems and potential bottlenecks. This new approach is designed to dramatically increase productivity within the factory and give clients real-time updates to help them better manage their own commitments, by adopting a power by the hour model for customers and turning this into “machining by the hour”. Our work with Aston University allowed us to devise and implement the visual factory approach in an efficient and effective manner. Instead of simply providing end-products to clients, the machines and tools at our factory will be made available as an extension or even as a replacement of the client’s own production operations. Not only will this reduce machine down-time, it also promises to save clients time and budget as they won’t need to pay overheads or additional labour costs in-house. How are you planning on implementing the necessary changes? We have thought very carefully about how we are making the move to transparent manufacture. As we don’t want to rush the change, the implementation of the ‘glass factory’ will happen through three clear stages. The first stage will enable us to see inside our own factory and allow us to anticipate potential issues, as well as streamlining operations on the shop floor. This will take the pressure off the walkabout staff whose job it is to spot issues and areas for improvement. As part of this initial stage, we will implement our recently upgraded Capacity Planning and Production Scheduling System to make production more efficient across the board. Stage two will bring the customer into the process, introducing an intuitive dashboard with real-time updates on how production progresses. Crucially, clients will also be able to see estimated dispatch times to help them better plan their own operations. If something else takes priority, clients are able to change running orders via an online portal, giving them an unprecedented level of control. The final stage is a refinement of stages one and two, removing all friction and barriers to production. Machines will be provided ‘by the hour’ to ensure minimal downtime and availability can be organised and guaranteed in advance making run-times dynamic and responsive to clients’ needs. All our clients will have their own production cells which they can self-influence and control remotely. How is ‘glass factory’ preparing AE Aerospace for Industry 4.0? Industry 4.0 is not often talked about enthusiastically in the SME manufacturing/engineering community, but is still the chief aim for businesses throughout the industry. While it may still be some way off for many, we are proving that it is within our reach. 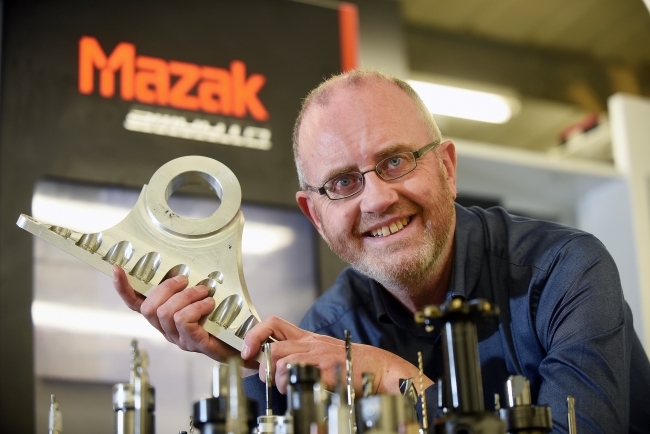 We recently won an Insider Made in the Midlands award for Manufacturer of the Year (under £25 million turnover) as a result of the work we have put in to embrace Industry 4.0. The judges at the awards said we are doing all the right things to keep the company flying – investing in equipment, skills and really embracing Industry 4.0. Our new ERP system allows us to use a system of integrated applications to manage the business and automate many back-office functions. This internal approach combined with the new machines are crucial elements of our value chain. Many companies are put off by perceived heavy costs of robots or new software. However, we believe AE is a great example of ways in which Industry 4.0 can be embraced not only through the introduction of new machinery, but also through the process from businesses management to shop floor implementation. We are investing in lean processes to further reduce waste within a manufacturing system without sacrificing productivity, time and product. Industry 4.0 for us started with the strategy. The technology and machinery comes after. You can have all the robots and amazing bits of kit in the world, but if you haven’t the skills, strategies and processes in place to use them properly then you haven’t implemented Industry 4.0. You have just spent a lot of money on a shiny machine. How have the changes you have implemented so far benefited the business? We have experienced a period of very fast growth which can be put down to the effectiveness of the new models, meaning that customer service is easier to focus on. A more automated process means that we can be more competitive with costs and lead times. We have more than doubled our workforce over the last three years and are moving to larger premises to accommodate this growth. How do you ensure supply chain excellence? A lot of the work we do is safety critical – this means that jobs must be tracked through all parts of the engineering/manufacturing process so that if something goes wrong we can find out how and why. The processes we put in place ensure that the safety criticality of the work carried out in the factory and the quality of the parts are never compromised, while maintaining competitive pricing. We believe we are a great example of a company exhibiting supply chain excellence. This is key as Primes (such as Boeing) face stiff penalties if delivery of planes should be late. The complete supply chain needs to work to a strict schedule and the processes we have implemented, and continue to implement, have meant that this is more easily achievable.